...... and not forgetting the one my students like best! The red one! You can't easily see but this one has lots of translucent red beads too! These were made by Gail Reed (see below for me copy and pasting from her website). 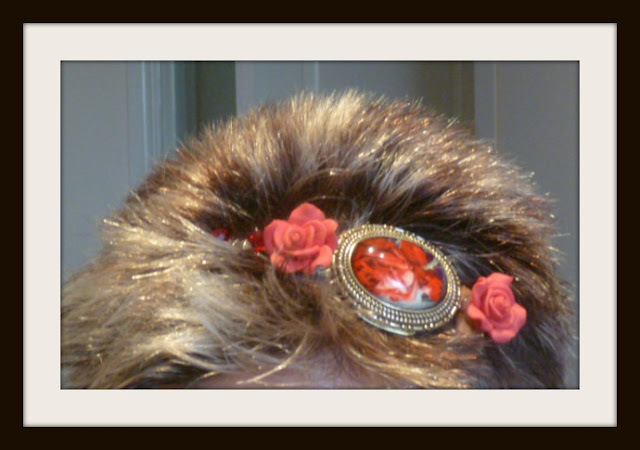 I'm mother-of-the-bride in July and huge hats or fascinators simply aren't 'me' so I started checking out other hair accessories and got addicted! I know that some of the pieces that make up my hairbands came from charity shops and Gail deconstructed jewellery before retrorecycling it. So the charities win. I win. It's the proverbial ....win-win!!!! I now have a new passion. 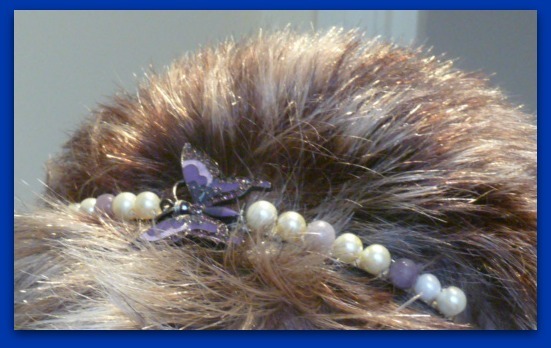 Collecting hair accessories. My wallet does not need this. Too late. Gail is great btw. Excellent customer service. I have super-short hair and it's a fabulous way of funking up my style. I have 4 of her pieces and I don't know yet which I'm wearing to the wedding! Pearls and Charm was created by me, Gail Reed. I have always had a passion for statement clothing and the beautifully unusual. I love fabric, lace, ribbons, pearl, bows and buttons. My dream is to inspire others to wear accessories made from recycled fabrics; ideally beautifully crafted, inspired and decorative items. I am designing and crafting accessories for Pearls and Charm at the same time as creating jewellery and stationery for my wedding in June 2012. The theme for our wedding is 'pre-loved' which came to us when we began to look into the amount of wastage that can come out of a wedding. Each piece is individually handmade from recycled fabrics, meaning that no two items are the same."